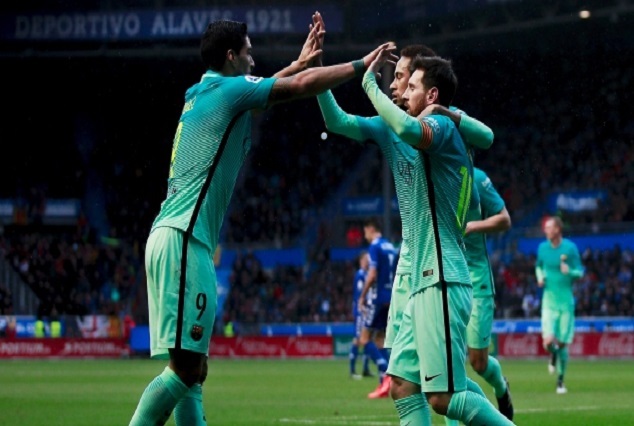 Neymar, Lionel Messi and Luis Suarez were all on target as Barca went top for the first time since October after smashing Alaves six solid goal at the Estadio Mendizorrotza on Saturday. It was a sweet revenge for Barcelona after CD Alaves defeat Barca in Camp Nou back in September, but couldn’t repeat the magic in front of their home fans. Luis Suarez struck twice to continue his scoring run with 10 goals in nine appearances in all competitions and the Uruguayan is also on the verge to repeat last season La Liga goal feast, currently leading with 18 goals followed by Lionel Messi with 17 goals. Barcelona dominated most of the first half with the home side camped firmly in at defence and waiting for the breakaway chance to punish wasteful Barca. At 37 minutes Ivan Rakitic raced towards unmarked Aleix Vidal as the right back produce a low cross into the penalty area with precision Suarez drives the ball past Alaves goalkeeper before Neymar make it 2-0 from Fernando Pacheco error just three minutes after Suarez goal. Messi pounced on Carlos Vagary’s mistake and make a quick run into the 18-yard box before drilling a left-footed shot between Pacheco’s leg. Alaves fumbled to stop Suarez pass to Messi when Ruano knocked in an own goal trying to stop Messi half way to the ball. Suarez produces a stunning counterattack that finds unmarked Rakitic and the Croatian waste no time finding the net, while Suarez brace came in two minutes later blasting home a rebound. Yet, Barcelona sweet revenge was halted late in the 87th minute when Aleix Vidal right ankle twisted into a sickening position and was stretchered off and rushed to the hospital. A primary test has been carried out and no bone is broken the former Sevilla defender have only suffered a ligament damage but could be out for the rest of the season.